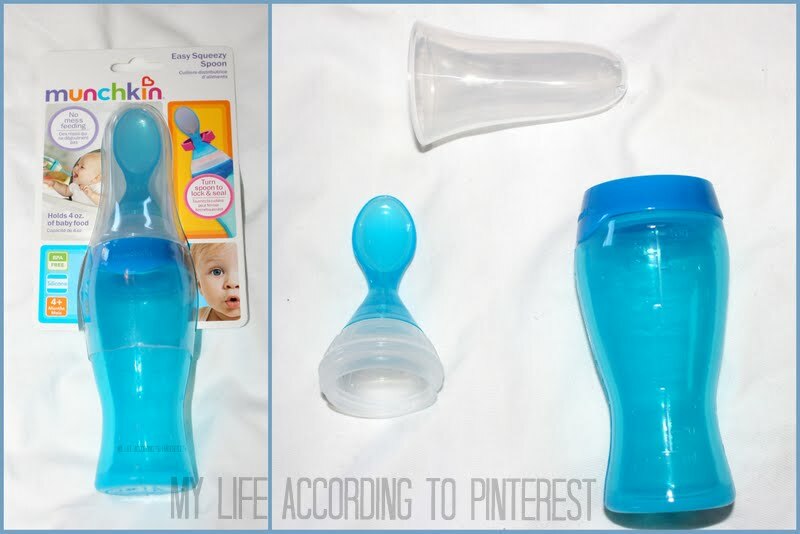 For this review Munchkin generously sent me the Fresh Food Set, the Easy Squeezy Spoon, the Fresh Food Freezer Cups, and the Trainer Cup. Munchkin's new Fresh Baby Food System has everything you need to prepare healthy, homemade baby food. The first thing that Baby Boy and I tried was the Easy Squeezy Spoon. This spoon holds up to 4 oz. of baby food and locks when it closes to prevent food from spilling. We tried this out using some sweet potatoes. This would definitely be best for on the go feedings or for feeding the purees you made yourself. We really liked this spoon. It's soft so Baby Boy liked biting on it. The food slides easily onto the spoon when you squeeze it and a nice amount comes out- not too much or too little. This spoon really helped to keep mealtime a lot less messy for me and Baby! I did have to tilt the spoon up a lot as the food amount dwindled to get the rest to squeeze out and there was still a little bit left in the end that I just couldn't get out. So, there is a little bit of waste. 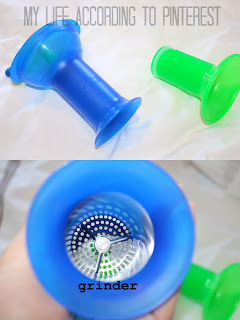 The Easy Squeezy Spoon was easy to clean, but you definitely have to take apart the whole spoon to get all the parts totally clean. You can also put this in the top rack of the dishwasher to clean, so that is really convenient. The Munchkin Fresh Food Set helps natural food take a turn for the better! With the fresh food grinder a little turn is all the power you need to turn any food into healthy, natural baby food in seconds. Veggies, fruit and meat are ground down to safe-to-swallow pieces. I wouldn't recommend this for just starting solids though. It definitely doesn't puree the food like you might want in the beginning. I imagine it would perfect once your baby can eat Stage 3 type foods. It’s is super easy, compact and the perfect size for traveling. No batteries or electricity needed. First, you do have to steam your food, then you put it in the grinder, push up and turn the handle, and viola- you have baby food! This really helps you to safely introduce fresh new foods to your baby. The perfect consistency to put in your reusable pouch! Or to store in the Fresh Food Freezer Cups for later. 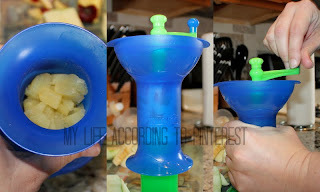 That brings me to the next product we tried, the Fresh Food Freezer Cups. These are 4 silicone storage cups that work perfectly with all of your freshly prepared baby food. Each container holds 4 ounces of baby food and is made of durable, food-safe silicone to easily pop out food. The 4 cups nest in a tray to neatly organize in the freezer. I really liked these silicone cups. They're big so they do hold a lot and super easy to fit into the freezer with the tray or by them self. You can get more cups with different color coded lids so you know what's in each cup. Plus, the trays are stackable for easy freezer storage. Last but not least, we were able to try the Trainer Cup. Munchkin’s new line of Click Lock™ Cups are just right because they just CLICK. These cups feature a simple click-and-lock lid to securely close for a leak proof seal – guaranteed. You can actually see, hear and feel the cup lock, so you have triple assurance against dribbles, drips, spills and leaks. Munchkin is so confident these new cups are mess-free, that they are backing up the promise with a 100% replacement guarantee! Baby Boy is just getting started using sippy cups and he's still getting used to them. (He doesn't really like water at all and makes the funniest faces when he drinks it.) I do think it was a little bit harder for Baby Boy to get the water out though. He had to "bite" down in just the right spot for the water to flow. I could tell he was actually getting some when he made his funny face. But the good news is this sippy cup definitely doesn't leak! I turned it completely upside down and NOTHING came out. Click Lock™ cups are available in an assortment of vibrant colors, fun artwork, licensed characters, and styles including sippy, trainer, straw, flip straw and Big Kid™ spout-less. Follow & Connect: Like Munchkin on Facebook and follow them on Twitter. Buy It: You can buy some of these item from Munchkin's website and all of them in stores. Check here for a list of retailers where Munchkin is sold. What's your favorite Munchkin product? Wow! These are pretty cool products! The spoon looks really interesting!